Rocket Matter Knowledge Base Google Integration (Calendar and Email Sync)How to sync, view and bill for your Gmail emails into Rocket Matter. 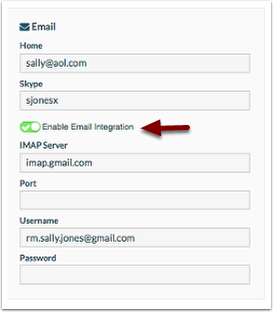 Rocket Matter's Email Integration allows you to integrate email accounts which resides on an IMAP email server. Please contact your email administrator to determine if your email is IMAP server-based. Some common IMAP server names are listed below. 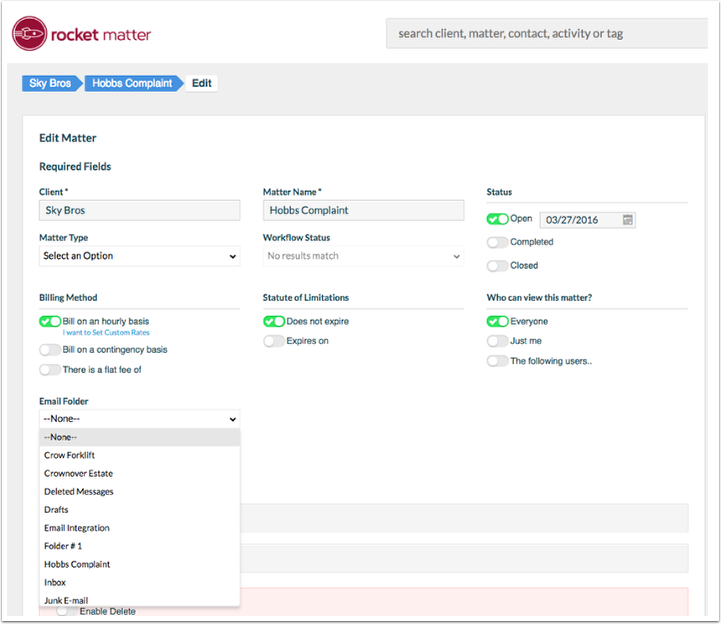 After integrating your Rocket Matter account with your email account, you can map one email folder to your 'Matter Emails' section. Once mapped, all emails contained in the email folder will populate the 'Matter Emails' section. Billable time can be attached to Matter Emails, extending Rocket Matter's 'Bill As You Work' technology to your emails as well! 2. Viewing your user profile, scroll to the bottom of your page. 3. Click to 'Enable Email Integration'. 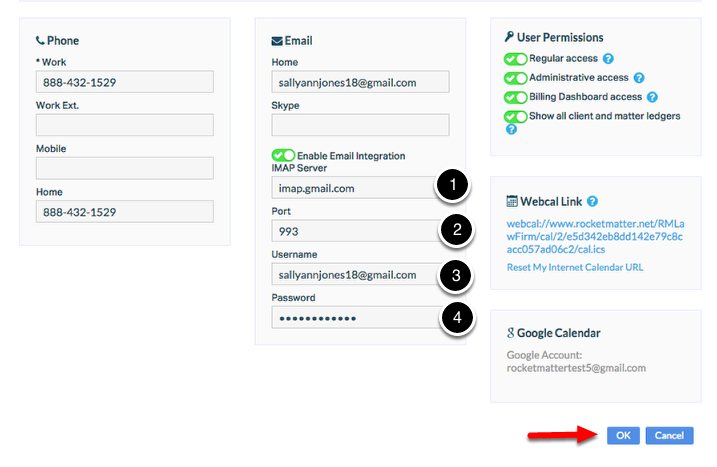 Email integration is configured separately for each Rocket Matter User. Each User can integrate one email account only. 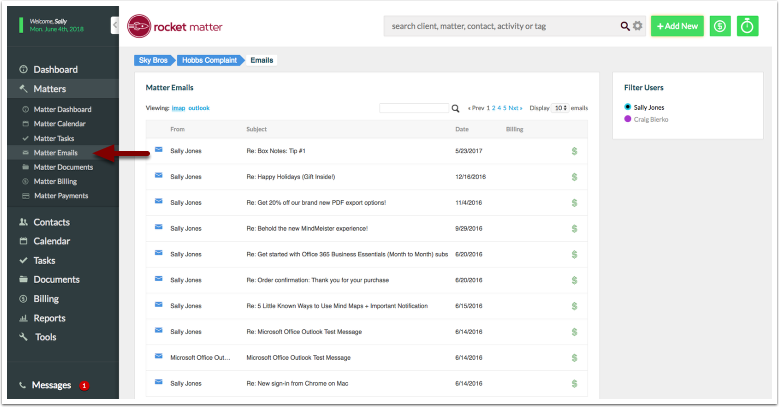 Multiple Rocket Matter users can map their email folders to the same Matter Email section. 4. Enter IMAP credentials, and your email username and email password. Click 'ok' to save changes. Note: If you're receiving an error when entering your email username and password with the correct credentials make sure you're allowing less secure applications. In order for the integration to be successful, click on the following link below to allow access. Note: If Two-factor authentication is enabled, this may need to be temporarily disabled to allow less secure applications. Click here to learn how to disable two-factor authentication. 5. 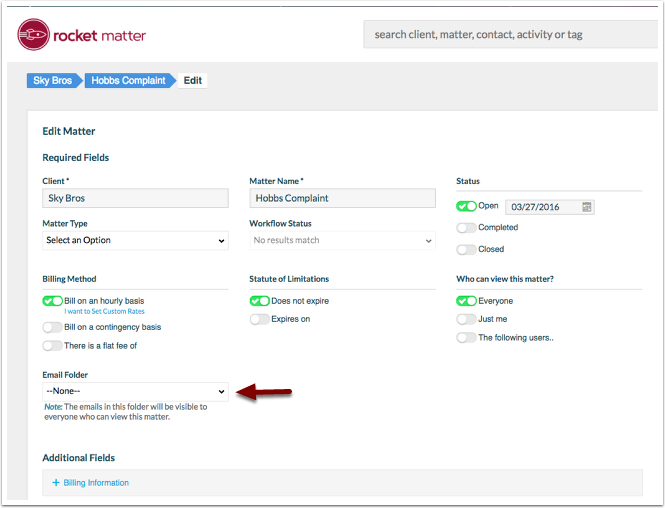 After you enable your Email Integration, you can map email folders into your Matter Emails section as follows. 6. In your Gmail, view the email you'd like to sync to Rocket Matter. 7. 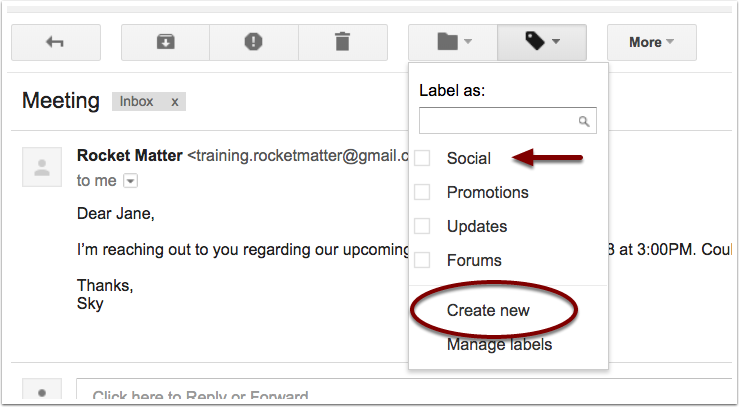 Create a new label; click on the label icon while viewing the email. 8. You'll be prompted to select from any existing labels, or click to create a new label. 9. Name your label, and click to create. 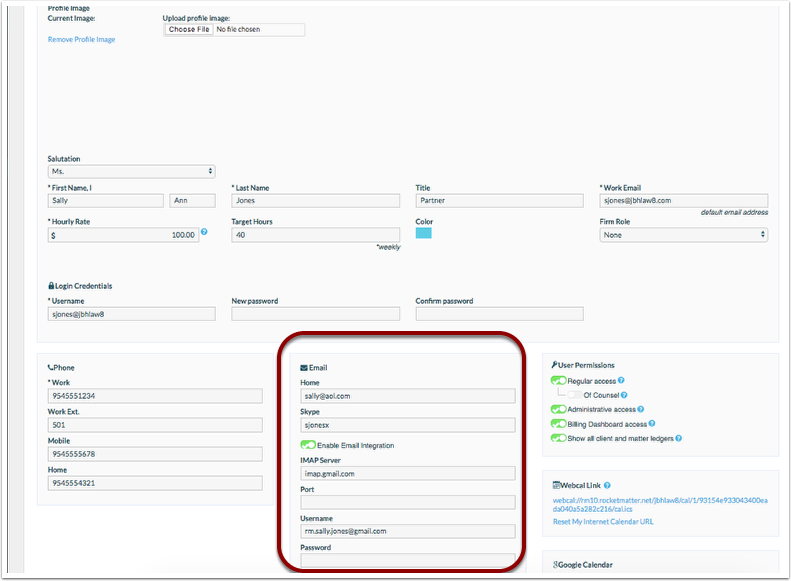 It's recommended to label the email with easy identifiers, such as the related client or matter information. 10. You'll notice your email has been labeled. 11. Navigate to the matter, and click 'Edit Matter'. 12. Click the 'Email Folder' drop-down menu. 13. Select an email folder. Don't see any folders? Click here to learn how to create email folders. 14. Be sure to scroll down and click "Save Matter". 15. While on the matter dashboard, click on 'Matter Emails'. 16. 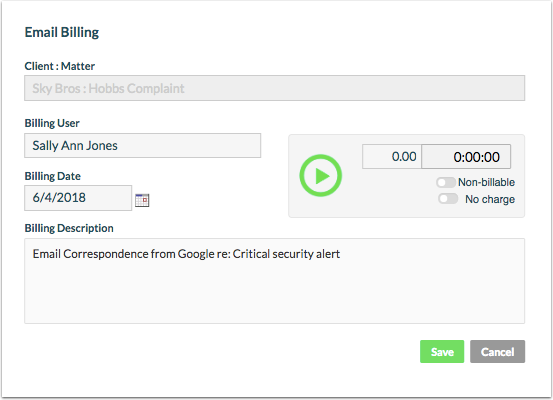 Capture billable time from an email by clicking "$". 17. If you choose to bill for this email, enter all applicable billing information. Click 'save' when finished. 18. You can also search, display, and navigate through pages of emails. View the contents of another user's email folder by clicking on the different users name. 19. Click on the 'From' or 'Subject' links to view the matter email string. Prev: How to sync with Google calendar. Next: Things to know before syncing your Google calendar.